Official Results: Just the facts; this is what you came for, right? More Information: The statistics don't paint much of a picture, do they? This section has more information about the actual coffees. Behind the Coffee: The epic saga of the making of CoffeeWars 3.0, complete with all the gossip and inside stories you need in order to feel like you were really there. Photos: Some people took pictures of the event, and you can look at them. Shouts Out: It takes a lot of love to start a Coffee War, and here's where we pay proper respect to those that contributed. It was the smallest year yet for CoffeeWars, but we had a great time, and are very much looking forward to the next iteration. This page is long and comically verbose, but I had a great time making it, and I figure there are probably a couple people out there who might be interested in as much CoffeeWars information as they can get. After all, it'll be a while until CoffeeWars 4! How did we decide it would be a tie? We just did. It wasn't hard. The truth of the matter is that with only two entrants, it's not a very exciting contest, and there's no real point in declaring a winner. Besides, doing so would make 50% of the staff real sad, and neither of us wanted to make the other sad. When the time came for us to wrap up, we were just happy we made the effort. Plus, like the sign on the Alamo says: we're all winners. The Whole Saga, Except For The Results At first, it seemed as though this year's CoffeeWars might be doomed. Rob (the founder) wasn't going to make it. Jay Dyson (who had previously been instrumental) also wasn't coming. Nobody wanted to be in charge. After some discussion, a loose-knit coalition of Coffee Heroes was formed, and they agreed to meet and conduct (a smaller and less rigorously organized) CoffeeWars on their own. There were no coffee makers in the Alexis Park rooms. Since no participants had room in their suitcases to bring coffee makers from home, this was a crippling blow. Some people didn't show up. In fact, only Mark and Foofus showed up. Shrdlu was there, but (as is perfectly reasonable) didn't want any part in organizing the event. Where the heck were the others? I have no idea. With heavy hearts, and with several mumbled utterances of excerpts from Shrdlu's Second Theorem of Coffee (see hyah), the die-hard team of Mark and Foofus had no choice but to postpone CoffeeWars until Saturday morning. This, obviously, brought the event into conflict with the DefCon shoot, but what can one do? Good coffee demands sacrifices. Besides, we weren't armed. Foofus and Maureen went to Wal-Mart to get coffee makers. Shrdlu went someplace else, and picked up cups. Mark organized a big vessel for water. All was ready. The tension was palpable. I don't even know what that means, really, but there you have it. The time came, the whole thing happened, as described. We were happy. We had good coffee. Nice people came to help us drink it. It was a good time. One advantage to doing things on Saturday morning was the relative scarcity of people asking where to register, and whether or not we knew where stuff was, and what we were selling, and so on, and so on. As we were setting up, a member of the Alexis Park Building and Grounds (get it, "grounds?") staff approached us. He was nervous about the fact that seemingly unofficial folks were setting up a table with appliances and hot water in a hallway during the convention. Who could blame him? Indeed, for a moment, we felt as though we might be in a tricky spot, since we really didn't have any official permission to do what we were doing. When we told him that we were mentioned in the conference program, though, he relaxed, and in fact he helped us (along with a nice goon) to make sure our table was off to the side, and not likely to be struck by oncoming pedestrian traffic. The bartender inside the main bar was also a very nice guy. When Foofus showed up with a huge jug, he patiently filled it, asking no questions. Of course, 9:30AM isn't the busiest time in the bar, even during DefCon, but still, it was great being able to get the water we needed, since the jug wouldn't fit under a normal sink faucet. 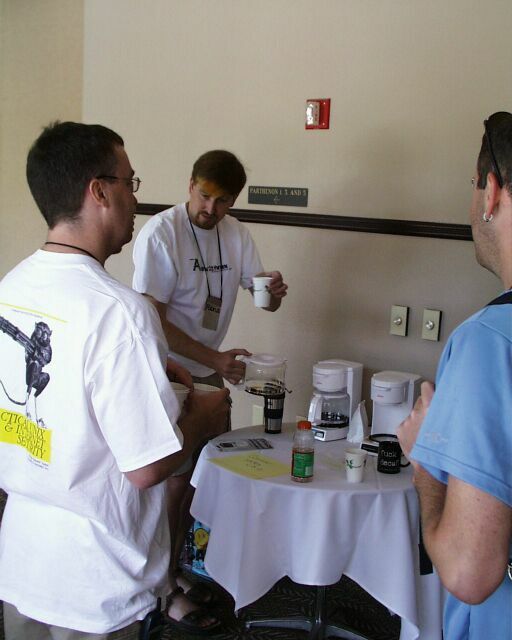 The coffee makers, by the way, were white Sunbeams, with a 10-cup capacity. They were emblazoned with "CoffeeWars 3.0 -- Official Brewing Gear" in black Sharpie marker. They were awarded to a gentleman who was able to answer a trivia question about the password for the Master Control Program in the movie TRON. And thus the story of 2002's most anticipated coffee-related hacker experience draws to a close. I sure had fun, and I hope that (if nothing else) my narrative has conveyed that fact. Mark: Mark Renouf stands proudly, sipping a magnificent cup of coffee at the vaunted CoffeeWars facility. People: Phen-phen, Otto Eyebiter, Maureen, Foofus, and Mark. Close-up: Otto Eyebiter, Foofus, and Phen-Phen. Triumph of the Swill: An animated anti- Starbucks propaganda film (based on Leni Riefenstahl's "Triumph of the Will") by Michael Worobec. It is a 740KB computer-animated AVI, and it's very amusing. You will watch it over and over! Etaoin Shrdlu: Went and picked up the cups. The coffee would have been too hot to handle otherwise. Maureen: General all-around help, especially with going to get the coffee makers, and with cleanup. Dark Tangent: He was very encouraging to us about the event, and gave us elite black badges. David: He took nice pictures. The Alexis Park Buildings & Grounds Guy: He helped us get our table set up. The Alexis Park A.M. Bartender: He let us refill Mark's huge water jug from his special squirty thing. 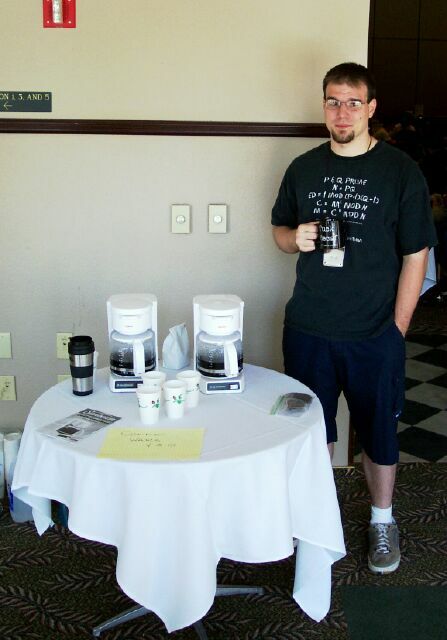 Rob Nielsen: The original Coffee Warrior, who had the idea for the event. Jay Dyson: We're pretty sure he was there with us in spirit.